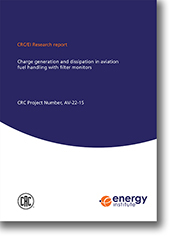 This report describes experiments undertaken to examine charge generation and dissipation in aviation kerosene during the filling of tanks via filter monitor units. Since the last publicly reported studies of these processes, more than 12 years ago, there have been changes to both fuels and filter monitor element designs. The principal aim of this work was to see if these changes have had any impact on the charge densities that could be delivered to tanks. A secondary aim was to investigate the electric fields these charge densities could be expected to generate within a receiving tank. The report provides details of the experimental test set-up and procedures and a detailed analysis of the results. The extensive test programme described in this report was jointly developed and funded by the Coordinating Research Council (CRC) and the Energy Institute (EI). It was undertaken by Harold Walmsley (Harold Walmsley Electrostatics Ltd) and Daniel Taylor (AFTON Chemical Corporation).